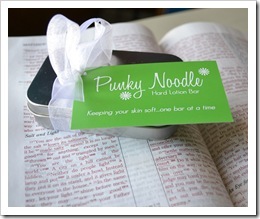 Punky Noodle Hard Lotion Bar Giveaway!! UPDATE: Congrats to Kristin for winning our Hard Lotion Bar giveaway!!! Ellie and I have been so excited about our new hard lotion bars! We think they are great and they are really helping my dry “always in the water” hands. 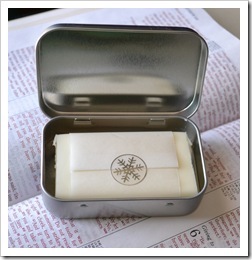 To celebrate, Ellie and I would like to giveaway one of our Hard Lotion Bars! All you have to do to enter is to leave a comment below and let us know whether or not you struggle with dry skin….hands? elbows? feet? What can you just NOT seem to keep moisturized no matter how hard you try? Giveaway runs through Monday at 10:00pm (CST). I suffer from dry skin, especially during the winter time. I haven't yet found a great moisturizer for my legs. They are almost painfully dry and flaky. My hands dry out. I'm constantly having to lotion up. My husband is the one who has severly dry skin. His is terrible. I saw this the other day and was wondering if it would help him. Hope I win!!!! I hate sticky lotions, but during the winter, my hands ache from dryness and even peel…its gross! Everywhere else is dry, too, just no pain. Used to have these candles that you lit and when the wax heated, you could use them as lotion. Those were great! Can't find them anymore. This looks promising, especially if they are fragrance free for ultra sensitive skin. These look great and headed over to check out the rest of your things on etsy. MY HANDS. I have the kind of dry hands after a hard day of cleaning the house that peels…its horrid! That looks really interesting. I have never heard of such a thing but I hate greasy lotion. The brand I have used for years recently changed their formula and is now not only much more expensive, but is greasy now too. My hands dry out all year long so they are always cracked and often bleed. My hands. Horrible. They always split and bleed in the summer! Also, my daughter has this weird eczema thing on her face that I'd love to put this on! I LOVE lotion bars but haven't had any in years! My cheeks and nose are always dry! I have really dry skin, especially in the winter. My hands get so dry in the cold. I have very dry skin in especially in the winter! I would love to try your lotion bar! My problem areas are hands and heels. I can't wait to try my bar on my heels – then maybe I won't have to use the Ped Egg anymore! Posting comment on the correct place this time! 🙂 My oldest daughter has terrible dry skin or eczema or contact dermatitis or something on her hands! It's so terrible and so sad. A 7 year old should not have cracked, red, sore-to-the-point-of-pain-&-tears hands! Tried everything and are using Vaseline right now. Ready to try your hard lotion bar girl! Oh my hands get so dry in the winter, right now they hurt. It doesn't seem to matter what I put on them, with four kids I am always washing them and they dry cold air really takes a toll on them. I'm intrigued by the idea of a hard lotion bar!